PRODUCT DESCRIPTION: Wheat germ looking granules. TARGET PESTS: Crickets, roaches, ants and silverfish. WHERE TO USE IT: Though it can be used both outside and inside, most applications for silverfish should be done in two places; where you see them in living areas and where they are nesting. Nest locations are generally going to be in wall voids and attics. Niban will last long; it remains active for several months so even if all is not eaten initially it will have impact several months down the road if new activity should start. RATE OF APPLICATION: Use one pound for every 500 sq/ft of surface area. This is needed for attics and crawl spaces. Living areas generally don't need that much. Use one pound for every 1000 sq/ft of living area. Have had good luck with product. Stays in place and can use it indoors easily. 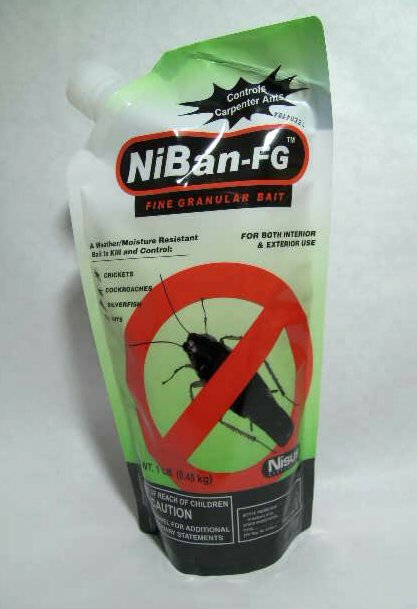 Will Niban Granule Bait kill or harm chipmunks? I really don't want to get rid of the chipmunks, which is why I am asking. 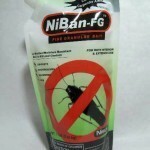 Niban uses nothing but boric acid for an active which is very safe for use around people, pets and in general, most any mammal including chipmunks. When used properly, it will not pose a hazard to them. And even if they ate some placed in the yard, it wouldn't be a problem. Seems to be helping along with Black Flag that I used till I rec'd Niban. Wanted to treat outside but am afraid to open my kitchen door. Would not be so petrified of them if they didn't jump so damn high. My friend said they are referred to as Sprigets, spider crickets. Worst emotional Summer of my life! So far so good! I have not really been using this long enough to give a definitive review but I will say that so far results have been promising. I put it out on 12/15. During the first part of December I'd say I was catching about 4-5 crickets a day manually, it was a pain. I hadn't had a cricket problem last year but I guess the spring/summer 2018 they moved in and became an increasing problem. Sick of catching crickets I ordered this and put it out and left town. Came back yesterday and sighted no crickets. Will have to keep and eye on things and will keep replenishing the poison but it's looking good so far. I have an unfinished basement where I think they were breeding. The horrible camel/cave crickets, not the chirpy black ones. No other bug issue!